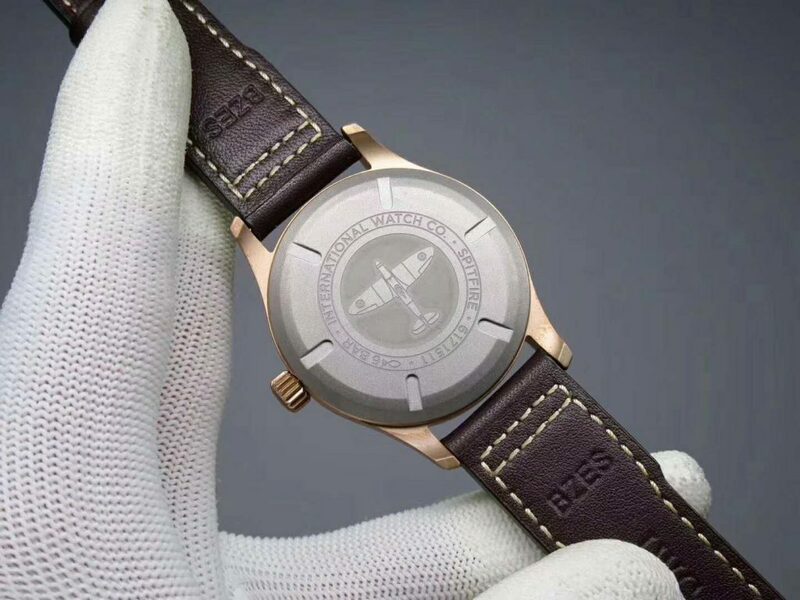 Now, more and more brands from Swiss watches industry are willing to use new innovative materials, forged carbon, bronze and even aluminum are used in the manufacturing of their watches. 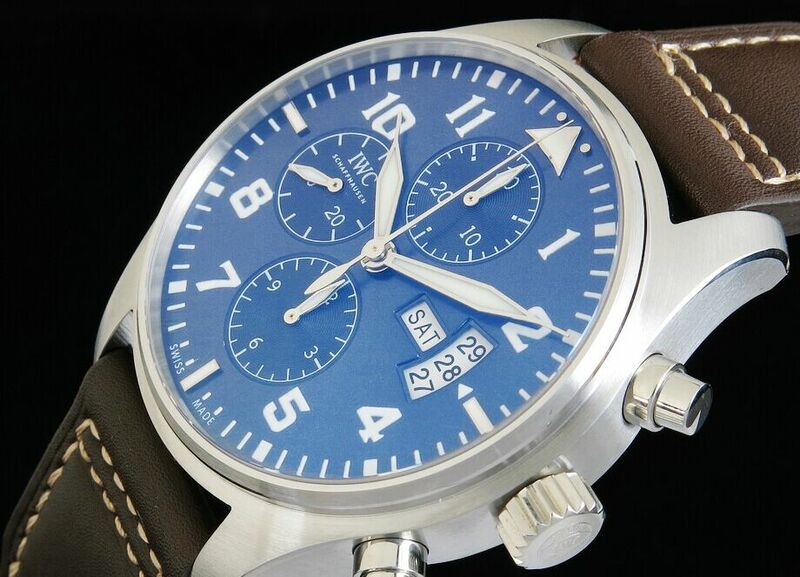 I remembered that there was one IWC Pilot watch made of aluminum in our market in 2017. 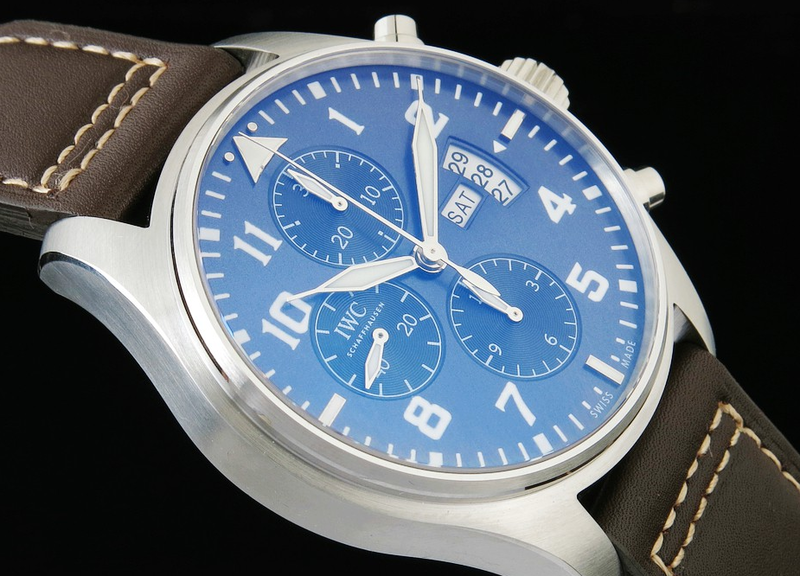 Today, I will introduce another IWC Pilot watch that is made of new material, which is bronze. Yes, IWC is absolutely not the first brand watch that adopts bronze material in their watch making, actually Panerai has already published one Luminor Submersible watch before that is made of bronze, which is PAM 382, and it is sold very well. Now, in our replica watch industry, the Panerai PAM 382 Bronzo replica from KW factory is still on hot sale. 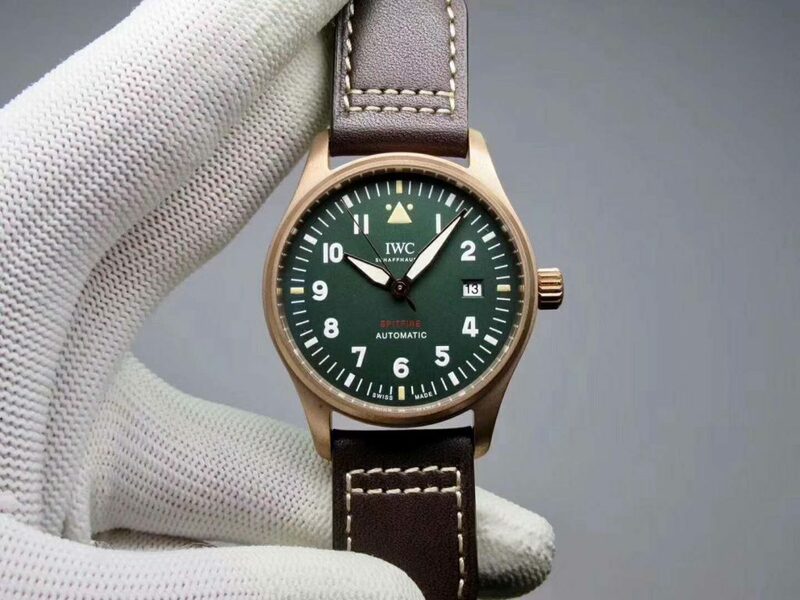 Today, the replica IWC Pilot Spitfire Bronze watch I am going to introduce is made by XF factory, the watch is really a novelty and the factory offers extra ketchup sauce packet and eraser for more fun when you wear the watch. 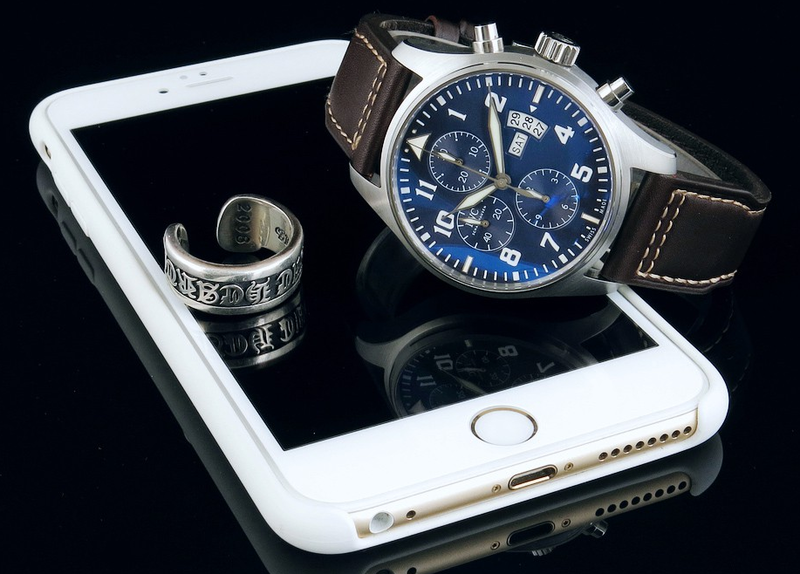 The case is 39mm in diameter, it is measured to be 10mm in thickness. The case is made of bronze that is fully brushed. 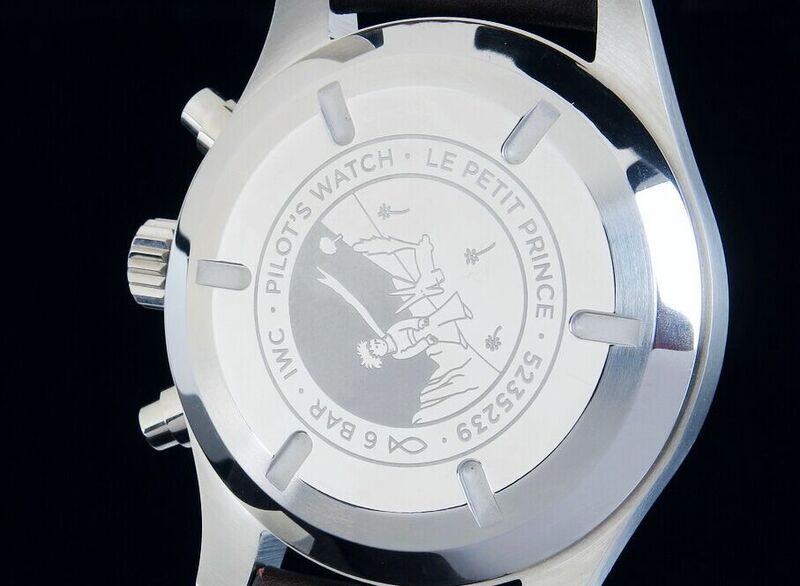 The case back is in micro-sandblasted finish, there is a spitfire airplane logo on the center of the back. 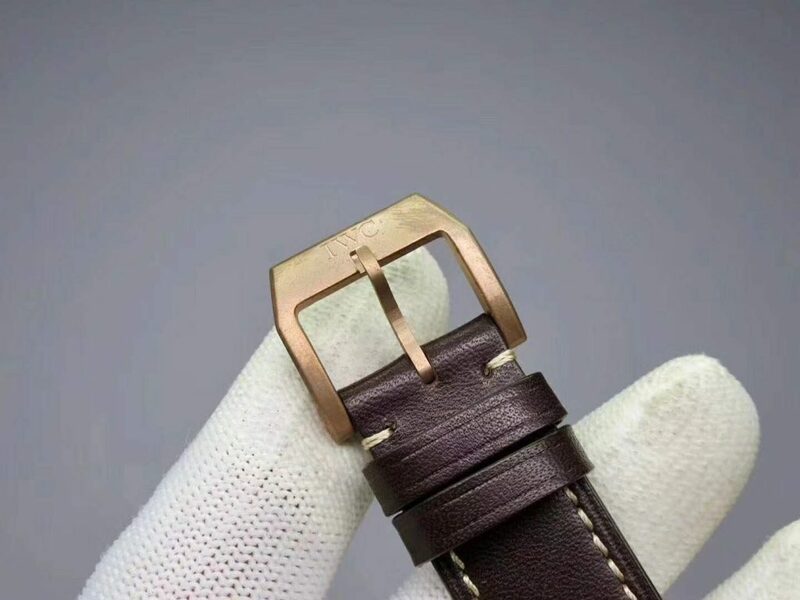 The case could be oxidized after long-time wearing, but the ketchup sauce offered by the factory could help you to clean up the oxidation, and making the bronze case look new and fresh. That’s the fun a bronze watch could bring to us. The green dial is a perfect match for the bronze case. In all bronze watches I have ever seen, they all have green dial. 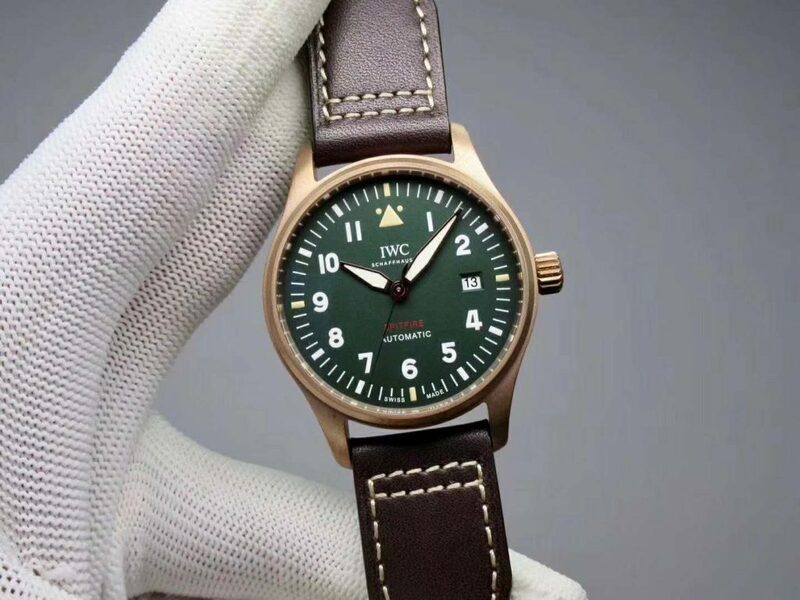 The bar-shaped hour markers at 3, 6 and 9 as well as the iconic Pilot’s triangle mark at 12 o’clock are all applied with luminous material, whose color is very close to the bronze tone of the case. Central hour and minute hands have rose gold edge and are filled with white luminescence on the center. Brown leather strap perfectly fits the bronze case and green dial. 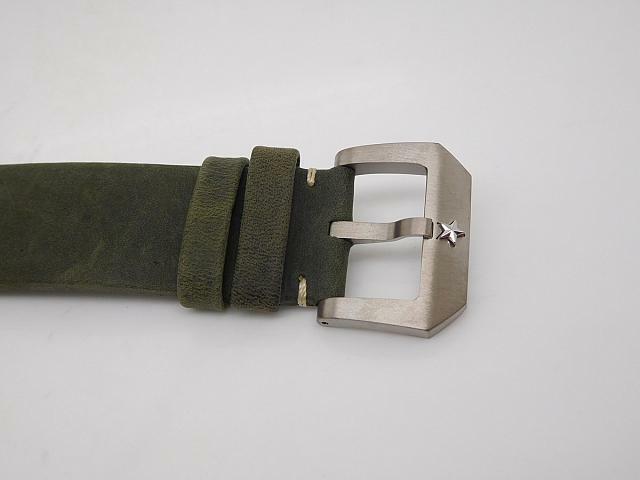 The band is made of genuine calf leather and has white hand stitching. The buckle is also made of bronze and fully brushed. 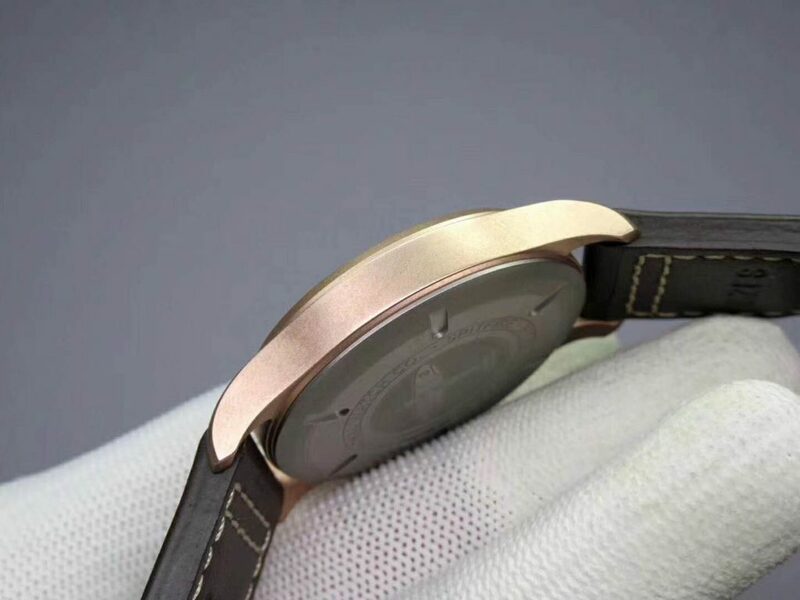 It looks like only brown leather band is the best fit for this bronze watch, black leather band will not look harmonious on this watch. I have not posted articles here for a long time, it is the end of the year, a lot of things need to be dealt with before the coming 2017, replica watches factories now are collecting advice from sellers like me, so that they could offer more good quality watches in 2017, you guys could share your opinions on replica watches by commenting on my blog, tell me which places should be improved on a specific replica watch you like, or which watch you want the factory to replicate in 2017, so I will tell the factories what you think about, because I ordered watches from them directly, they will take my advice. 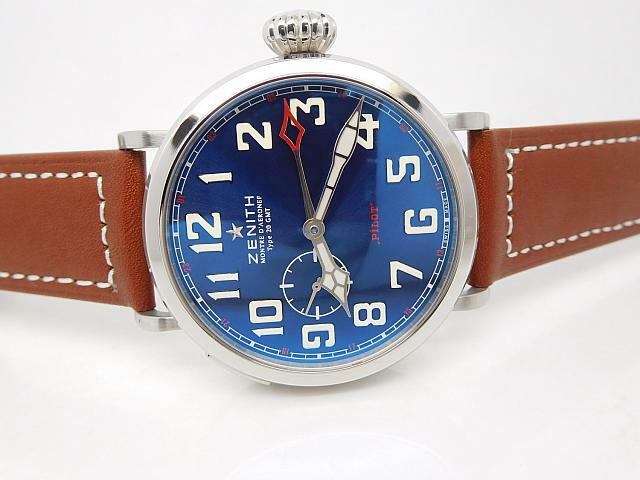 Today, I want to introduce another Zenith watch here, I have reviewed two popular Zenith watches before, they are Ton-up and Pilot Type 20 Extra Special, this one that is going to be reviewed today is not from ZF or V6, it is manufactured by a small factory but has a good quality. 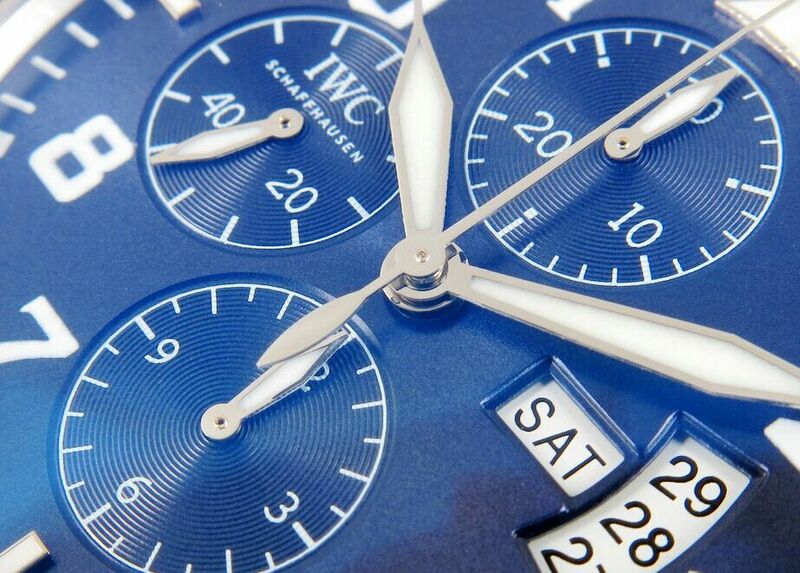 Especially the blue dial, it looks very charming. 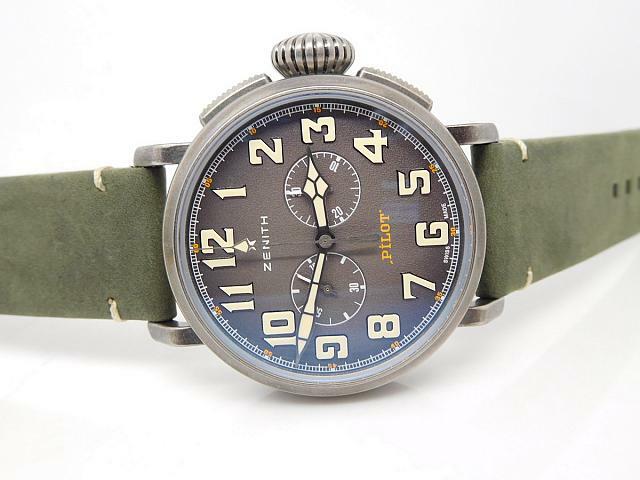 Big size is the common feature of these Zenith watches published in recent years. Case diameter is 48mm, which is even bigger than Rolex Submariner and most other diving watches. Round case features a big crown, which is pumpkin-shaped, the big crown is so convenient for the wearer to adjust time and date by rotating. The case mainly uses screws to fix four lugs. Whole case is brushed except the polished bezel edge. 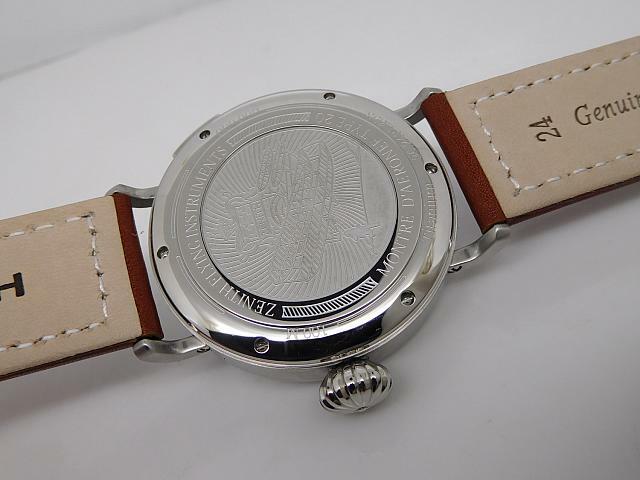 Case back is locked by six screws, there is an unique aeroplane pattern that is exclusive to Zenith, actually each Zenith Pilot watch has a different engraving pattern on back. Big dial uses four colors. The central silver hands with a red spear tip is not second hand, it is actually the GMT hand, while the second hand is running on the subdial at 9 o’clock. The dial, I think, is full of some Chinese elements, like three hands on the centre, they are more like a Chinese weapon in old times – the spear. 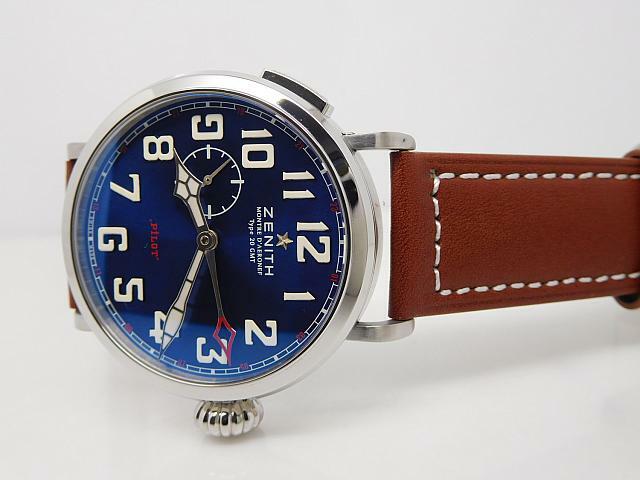 The logo of Zenith Pilot watch, a five-pointed star, is also very special. 24-hour GMT markers are in red on track scales. Hour markers are raised from the dial and all in white color, these digital markers will emit super green light in the dark. 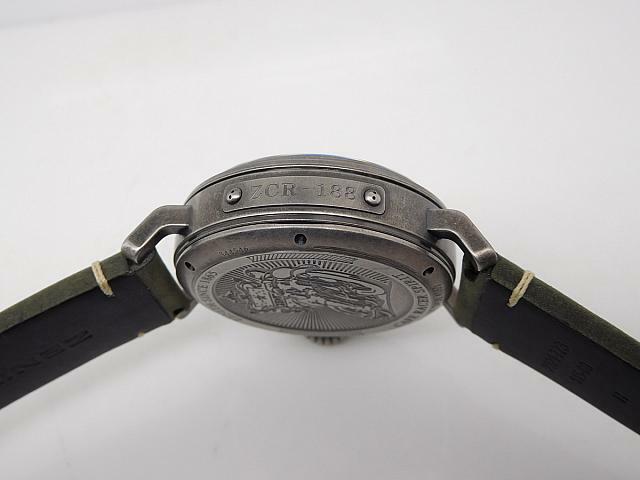 The leather strap refers to the band design of some Panerai watches, especially the buckle, like the Pre-V buckle on some PAM models. Brown leather strap with white hand stitching is very soft, it uses genuine calf leather to make, which offers a great wearing comfort. Finally, the replica watch is equipped with a 23 jeweled automatic movement, it is also sold at a much cheaper price than Zenith Type 20 Extra Special replica watch, now contact us to get its price. Our factories have always been keeping the pace in manufacturing good quality replica watches. 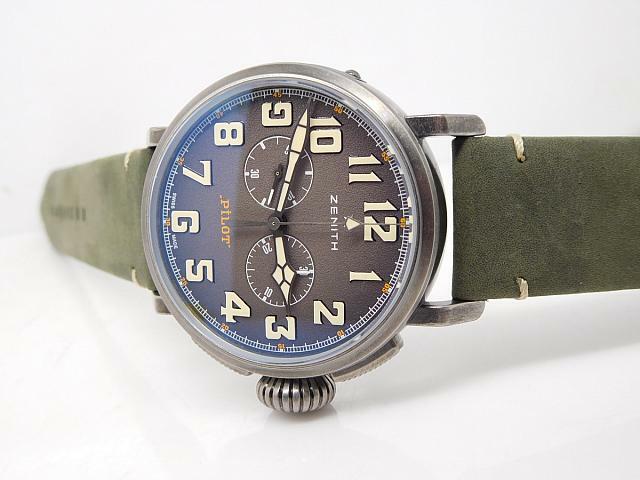 This time, V6 factory published another masterpiece after the release of Zenith Pilot Type 20 Extra Special replica. 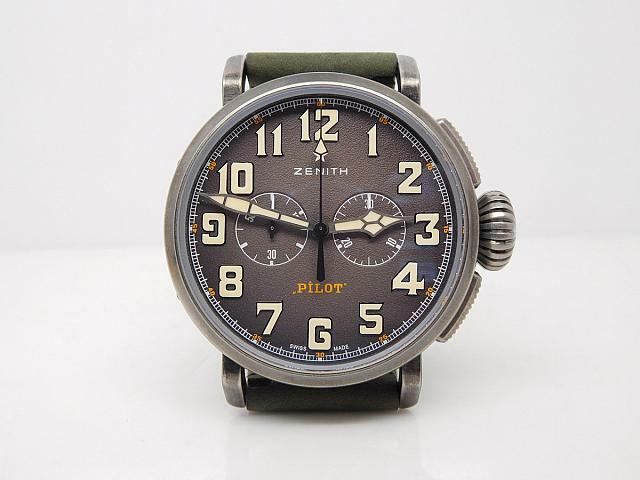 It is a good replica of the latest 2016 Zenith model – Heritage Pilot Ton-up that was published in 2016 BaselWorld. 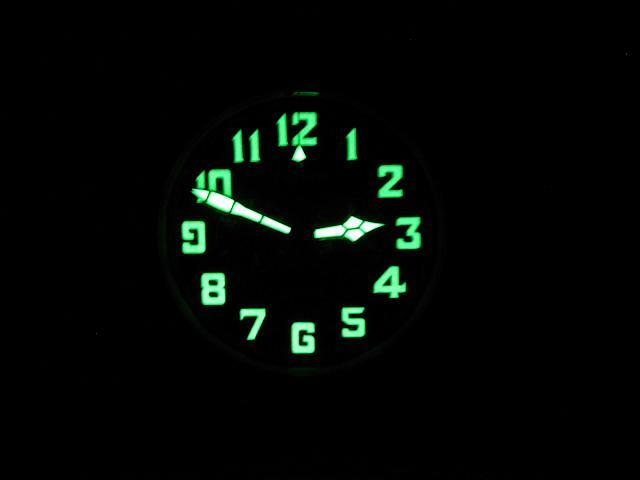 Like Pilot Type 20, this one also features a vintage appearance with super lume dial. 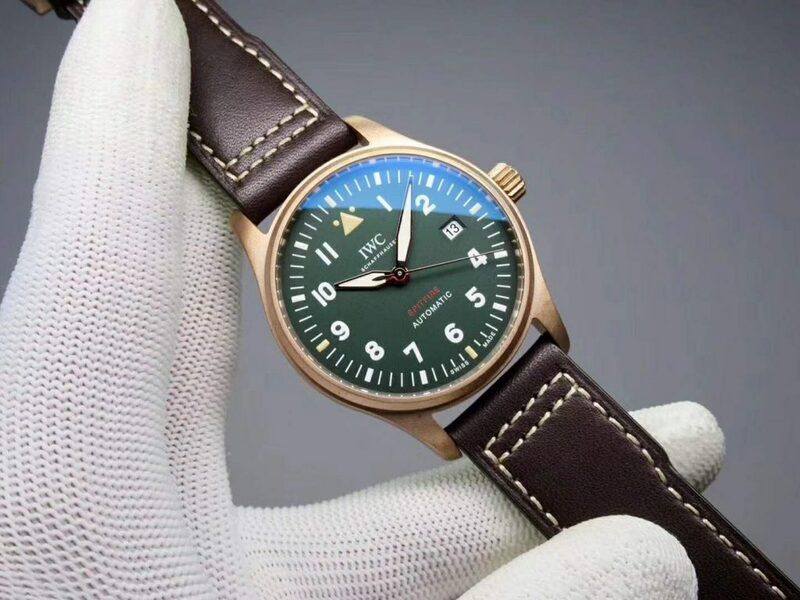 Although not as popular as IWC Mark series, Zenith Pilot attracted V6 factory’s attention to replicate and they believe that this replica watch will create another sales record like black Submariner 116610 LN, and this may become true because the first batch they released has been sold out. Now I am the lucky one who has a chance to buy this replica watch and write a review here. I will tell you how I feel on this replica. 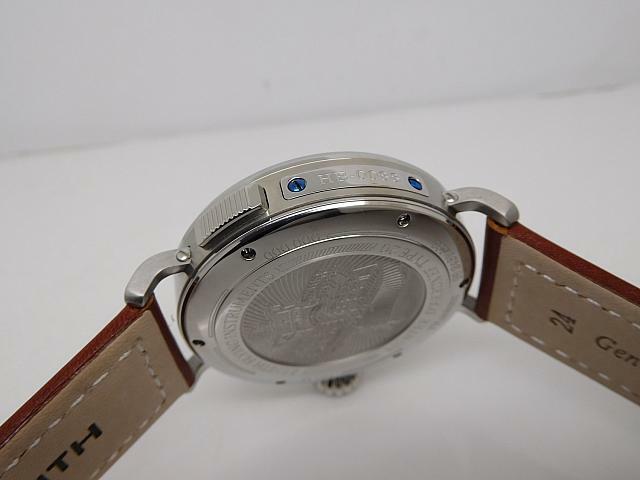 The case is made of 316L stainless steel, it looks a little darker than normal stainless steel case found on other replica watches. Because the case is aging processed that looks grey and older. Case diameter is 45mm, not including the big pumpkin-shaped crown. 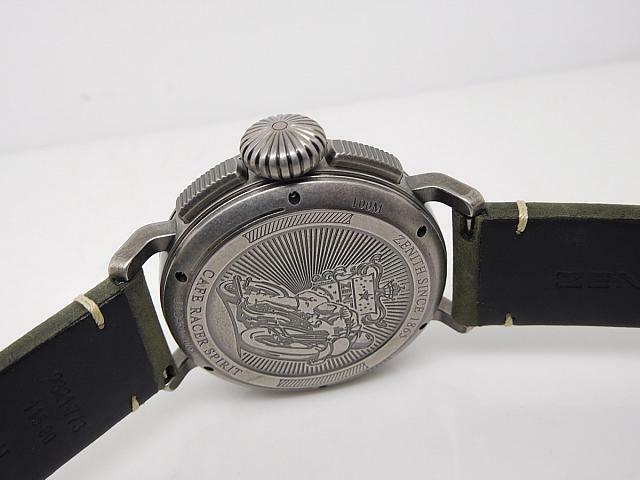 Case back is engraved with special pattern, which is a Zenith’s flag. Grey dial is sandblast textured, all Arabic numeral hour markers are exaggerately designed, these 3D hour markers are plump and fully filled with white luminous material. 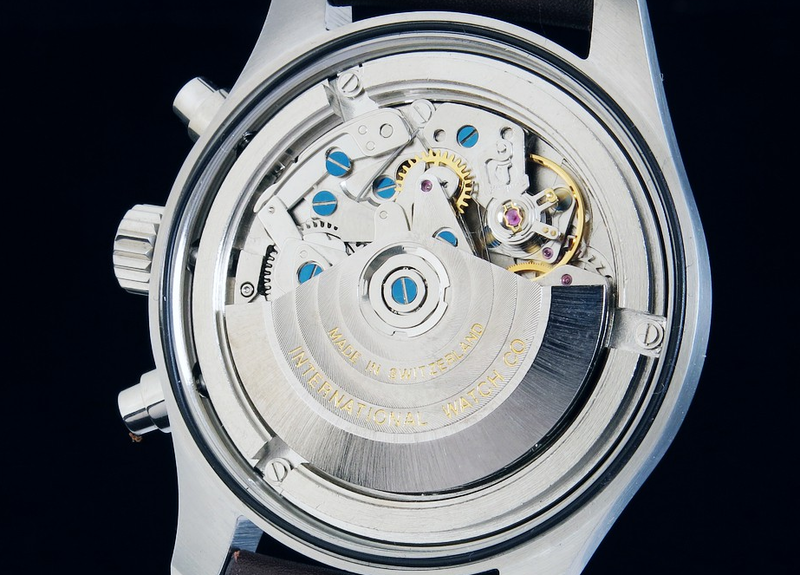 Because of being equipped with an Asian ETA 7750 movement, so the replica runs the same chronograph function as genuine Zenith Ton-up. On the dial, a small second hand is running on the subdial at 9:00, minute-chronograph counter is pisitioned at 3. Minute scales are in track style and there are orange minute markers on the track. On the top of “6” hour marker, the series name “PILOT” of Zenith is printed in orange. The dial lume of the replica Zenith Ton-up is very striking, that’s one of the strong reasons why a lot of people love it. The patina super lume on markers and hands are 100% the same as original. 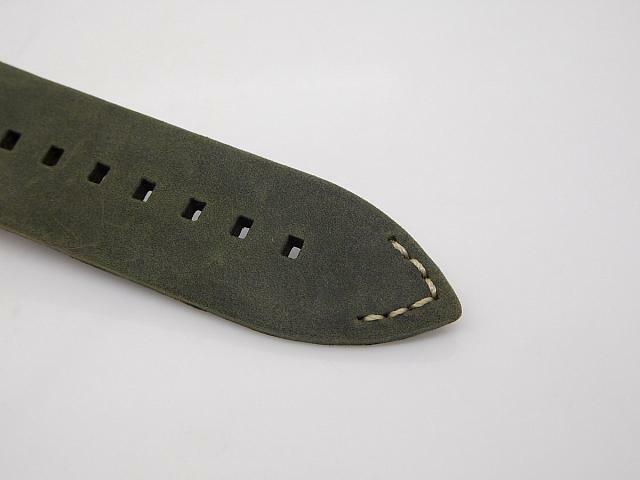 The band is khaki leather strap, but it looks more than grey, yes, in order to make the watch more in line with people’s vintage taste, the original leather band is aging treated, so it gets a vintage look. 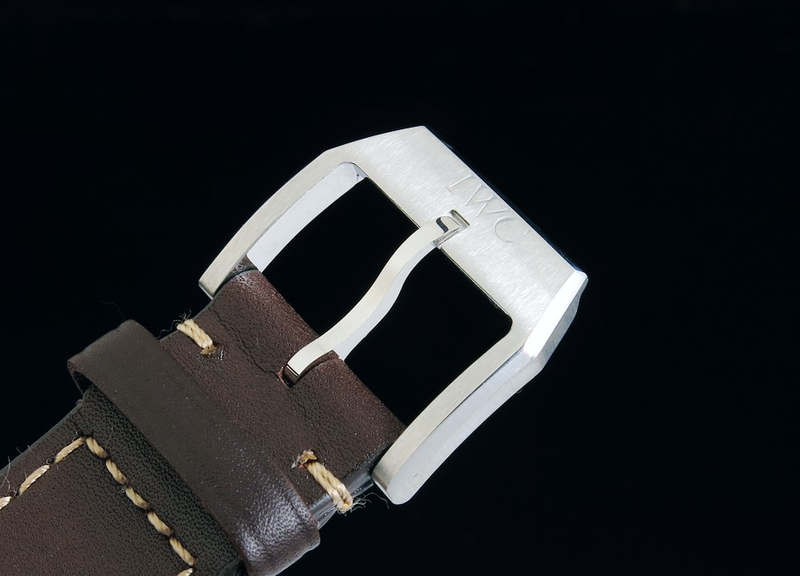 The leather strap has a rubber lining, which is sweat and moisture resistant, extends the life of the whole leather band. 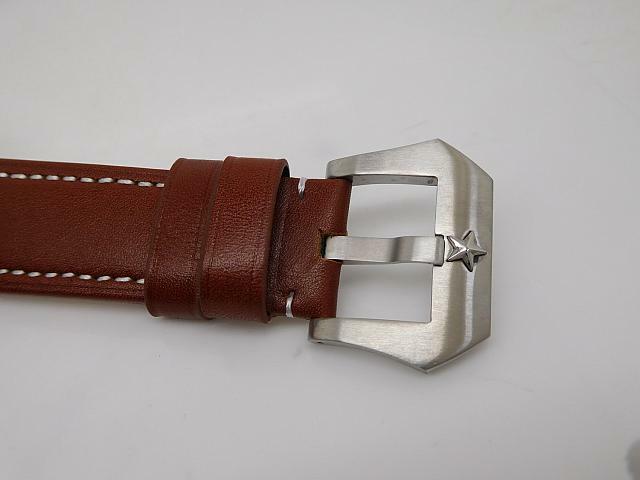 Brushed buckle has a 3D five pointed star in stainless steel, looks very special. 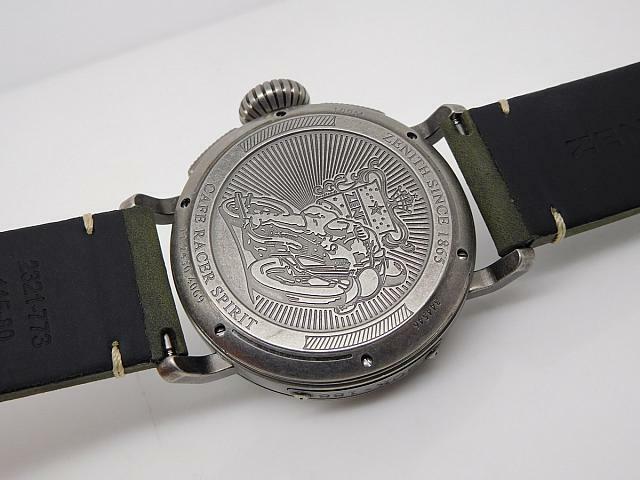 Overall, it is a great replica, especially a treasure for people who love vintage watches. 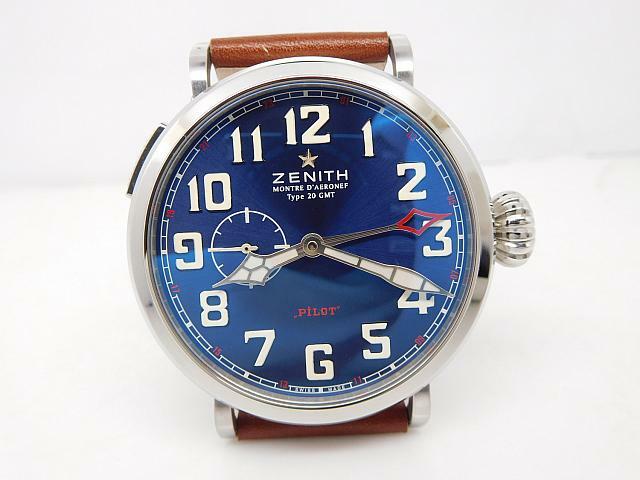 I am sure that the factory will continuously improve the dial details and case finishing, so there must be more versions of this replica Zenith Ton-up in the future. Long time not to post watches review here, because I must go to the replica watch market to get watches for my customers. 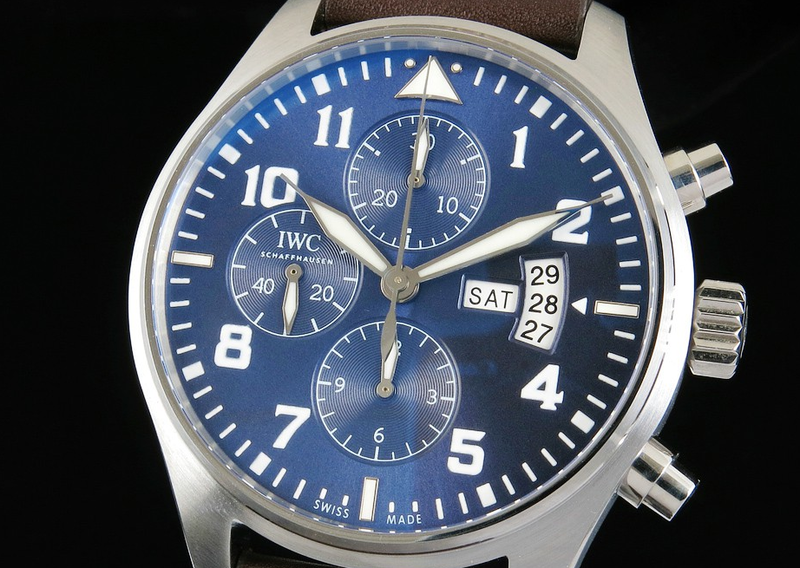 In recent days, factories released many new models, including a lot of IWC Portuguese and Pilot replicas that are favored by many buyers. The Portuguese 7 Days Power Reserve made by ZF was published several days ago. 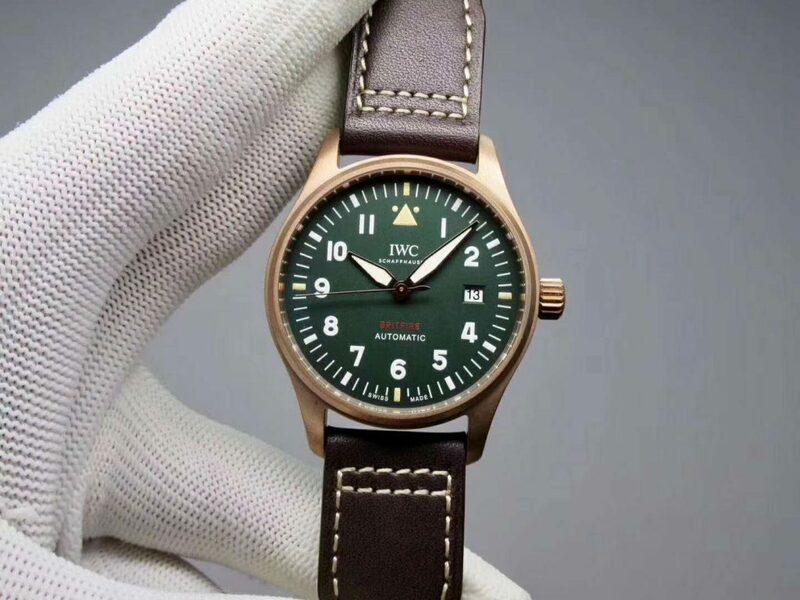 Today, I am going to introduce another IWC replica watches for you, it is the model in hot pursuit, the watch is produced by V6 factory, which makes a lot of high quality watches including many famous PAMs. IWC Le Petir Prince IW377706 replica is the latest work of V6F, there are other manufacturers having produced Le Petir Prince imitation watch, but this time by ZF, it is the best edition you will ever buy. 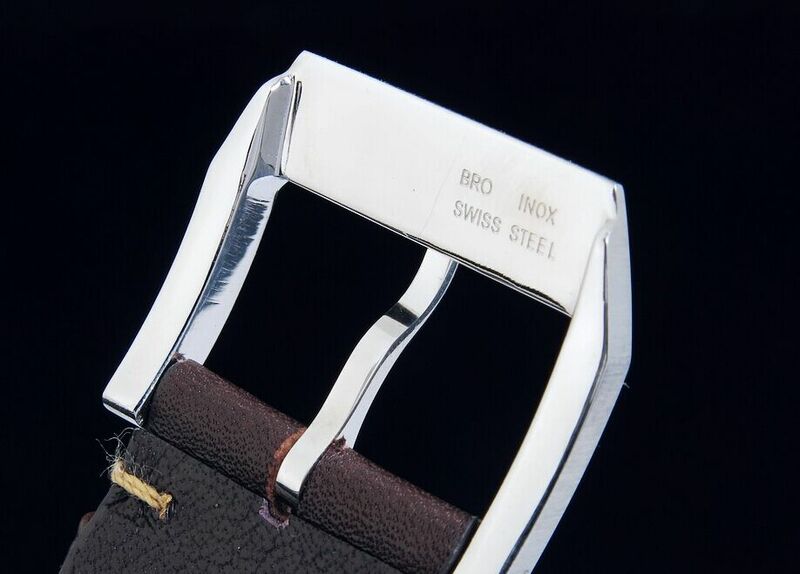 The case of replica IWC Le Petir Prince is made of 316L stainless steel, the case construction has 1:1 structure as per genuine, the inner case has a layer of anti-magnetic soft iron. Case is evenly brushed with top-level polishing craft, you can feel its superior finishing on case that is difference to other low-end replicas. The chronograph buttons have brushed face on top while polished sides around. 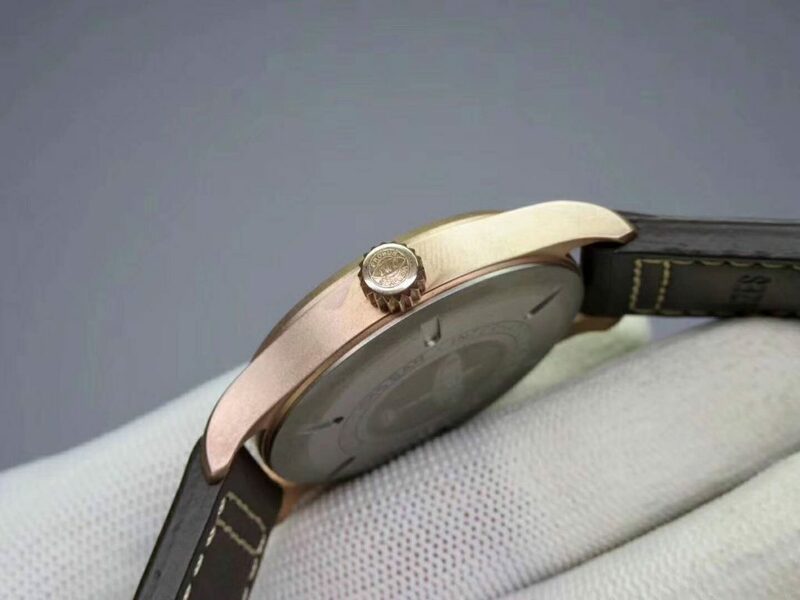 Actually you can tell high end replicas from poor quality fakes by touching its case, especially the polishing on the case corners, they should be round and smooth, so that the watch will not scratch your hand. 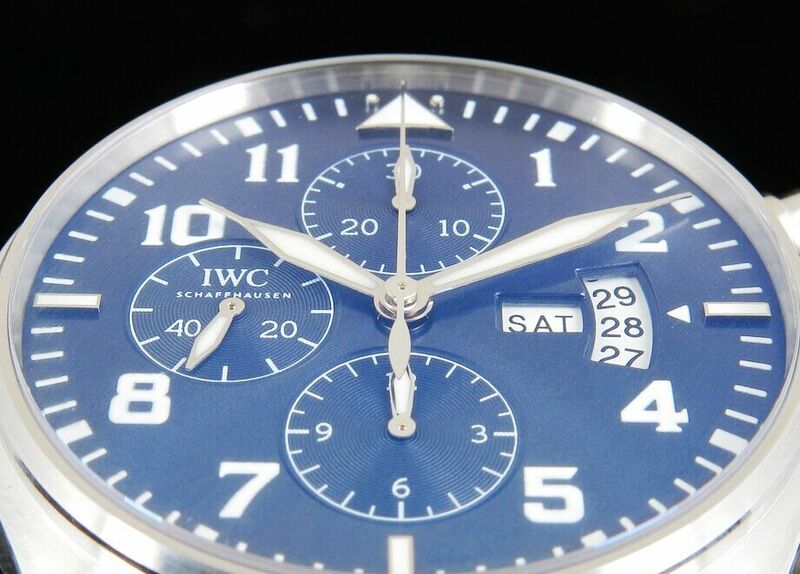 Blue dial is attractive, there are three subdials on, the small second subdial is positioned at 9 o’clock, top subdial at 12 is 30-minute chronograph counter while the subdial below at 6 is 12-hour chronograph counter. These dials all have circle patterns decoration. Date window is fan-shaped in white background with black font, the week display window is in square shape that is on the left of date window. 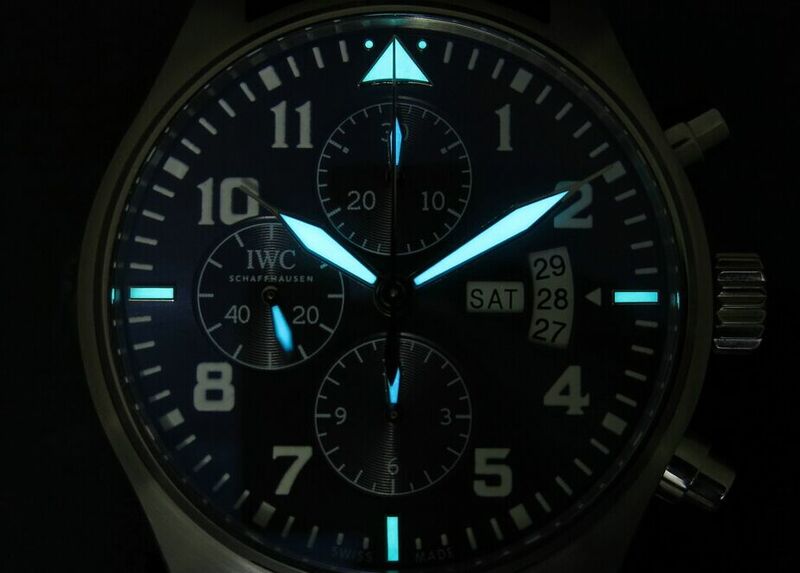 All dial details on the replica IWC IW377706 such as hands and 3-6-9-12 hour markers are coated with luminous material, which will emit strong blue light at dark night. The IWC Pilot Prince replica watch is equipped with Asian Valjoux 7750 movement, it is the new 7750 movement that has been updated so the stability and durability are greately improved. The engravings on case back are vivid, all are done completely by handcraft, you can feel by hand, every lettering and numeral has the same engraving depth. 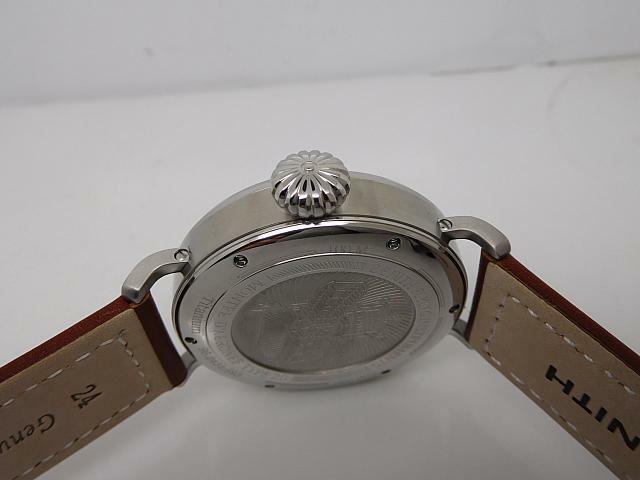 Such high quality replica watches all should feature such solid and superior case back. 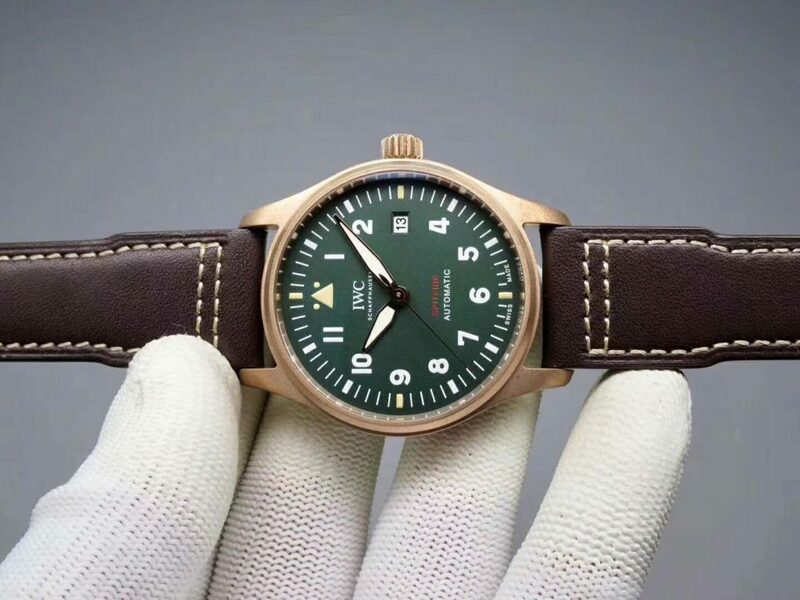 Overall, the replica IWC Pilot is a great imitation of genuine, do not wait any more because such quality replicas from big factory are not always in stock.